Jon Lord’s touring calendar is filling up for the rest of 2010. Until November, Jon Lord is planning concerts in Ukraine, England, Luxembourg, Sweden, Hungary, Czech Republic, Germany and Bulgaria. On June 16, Jon Lord will perform a very special concert with the Royal Liverpool Philharmonic Orchestra in their hometown. This is the orchestra that recorded Jon Lord’s two most recent albums, To Notice Such Things and Durham Concerto. The concert will feature To Notice Such Things in its entirety along with Concerto For Group and Orchestra and a couple of other surprises. Most of the other concerts also feature orchestral performances of Concerto For Group and Orchestra along with selections from Sarabande, Pictured Within and other solo works. But one or two shows are different. On June 23, Jon Lord will appear with a big band in Luxembourg to perform a special selection of Deep Purple classics and solo pieces – sung by Kasia Laska and Doogie White (ex-Rainbow). This show should feature plenty of Hammond organ. In July, Jon Lord returns as special guest to Robert Wells’ Rhapsody In Rock in Sweden. Last year, this show included rocking versions of Lazy and Burn. In September, he will team up with some old friends for a rare appearance of Daddy & The Steamers, a rock’n’blues outfit featuring Pete York, Maggie Bell, Miller Anderson and Zoot Money. Towards the end of the year, Jon Lord will again appear with Hagen’s Philharmonisches Orchester in Essen, a concert that is part of the “European Capital of Culture 2010” programme. 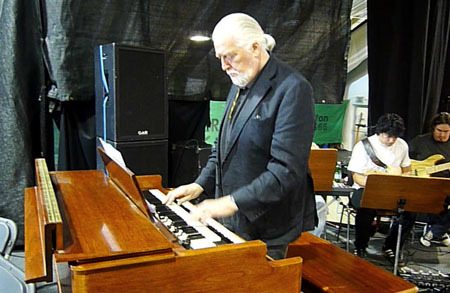 Check out the complete list of confirmed Jon Lord concerts. Hi Jon, May I wish you every success for your concert tomorrow with the Liverpool Phil. I’m very sorry not to be able to be there! Previous Previous post: Trondheim: Fantastic concert!